Whether scuttling across an ocean floor or a dusty desert, the 10 legs on the body of a decapod equip it with important survival skills. The foremost legs are often tipped with grasping pinchers, while the remaining eight are equipped with specialized feet to help it gain purchase on the rugged substrate. Ten-legged animals belong exclusively to the arthropod group, which contains crustaceans and insects. You'll find most -- but not all -- 10-legged animals living in the sea. Put your hand anywhere near a crab and chances are you'll get pinched. Crabs can pinch so hard that they've been known to lose their claws rather than let go. These strong pinchers are sometimes used to help a crab maneuver among rocks on the ocean floor, but more often to provide a defense or grasp their prey. Blue crabs have special paddle-like adaptions on their last pair of legs to help them swim. Lobsters are some of the most commonly harvested animals in the sea, but only a few of the hundreds of species of lobsters are of commercial interest. Like crabs, some species of lobster -- including the American lobster -- have claws on modified front legs for grasping prey and defending themselves. Other species -- like rock lobsters -- have 10 legs without the special adaptation. Lobsters eat mollusks, fish, plants, algae and other matter they find on the ocean floor. Crayfish are close cousins of the lobster that dwell in freshwater rivers and lakes. Like lobsters and crayfish, shrimp are decapods that feed off the bottom of their environment. 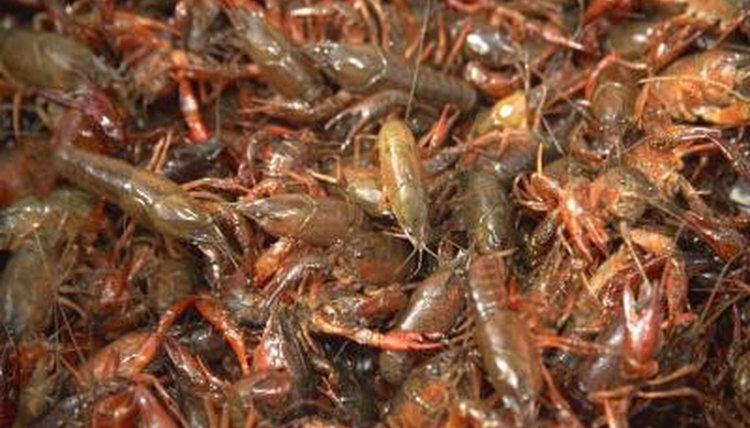 Shrimp begin their lives in the ocean, migrating into rivers and creeks to feed in the swampy marshes until they mature. By late summer, the mature shrimp again moves on to make his home in estuaries and sounds before returning to the ocean to spawn. The shrimp eat anything available in their environments, including worms, dead fish or other shrimp. Like crabs, scorpions have a pair of modified legs called pedipalps that are equipped with claws for grasping prey and their mate. Unlike crabs, the scorpion's other end is equipped with a long tail decked out with a poisonous stinger. The scorpion delivers a strong neurotoxin that immobilizes his prey. Sea scorpion fossils up to 8 feet long with claws 18 inches long have been found in Germany, Scotland and off the coast of New York in areas where the scorpion emerged to shed its skin or mate. National Aquarium: Two Legs, Four Legs, Six Legs, More! Heiploeg: What Does a Shrimp Eat?